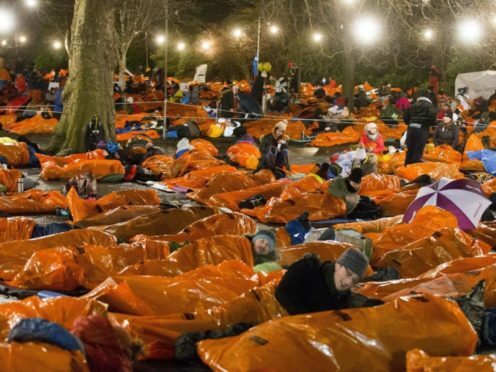 Armed with sleeping bags and warm clothes, thousands of people will take to Scotland’s parks this evening in a bid to help end homelessness. An estimated 10,000 people have signed up to brave the elements for charity Social Bite’s Sleep in the Park. Tonight people will hunker down in green spaces in Aberdeen, Dundee, Glasgow and Edinburgh – and it is hoped they will raise more than £4million to help people sleeping rough across the country, as they spend one night experiencing what some people face night after night. It follows success last year when nearly 9,000 slept rough in the capital’s Princes Street Gardens, raising more than £3.6 million for Social Bite’s initiatives in the process. A large cast of celebrity names have pledged their support to the cause. A message from Josh ahead of tomorrow's Sleep in the Park events. Singing superstars Amy Macdonald and KT Tunstall have signed up to perform gigs at each of the sleep-outs – being rushed from park to park by helicopter throughout the evening. Fellow musicians Eddie Reader and Callum Beattie will take to the stage in the Granite City’s Duthie Park, while Aberdeen FC manager Derek McInnes will read a bedtime story to the 1,800 participants. Fundraisers in other cities will be treated to shows from the likes of Lulu and The View’s Kyle Falconer, while Trainspotting author Irvine Welsh will speak to crowds in Edinburgh. The night will also provide a “highly emotional” return to the stage for band Frightened Rabbit, following the death of singer Scott Hutchison earlier this year. The Selkirk band had pledged its support to the event before this and Mr Hutchison’s brother Grant, who is also the group’s drummer, said it seemed like the “right thing” to do to honour the commitment. He said: “It’s going to be highly emotional, but I think the setting for it – both physically and the fact that it’s a charity event for Social Bite – means it’s a positive way to do that for the first time. Social Bite co-founder Josh Littlejohn said: “The weather forecast is looking cold and rainy so please wrap up and bring an umbrella. “The money raised is going to provide support to the 20 people living in the Social Bite village and initiatives throughout the year including employment programmes.